This is the High Performance version of this battery offering a respectable 180 CCA. 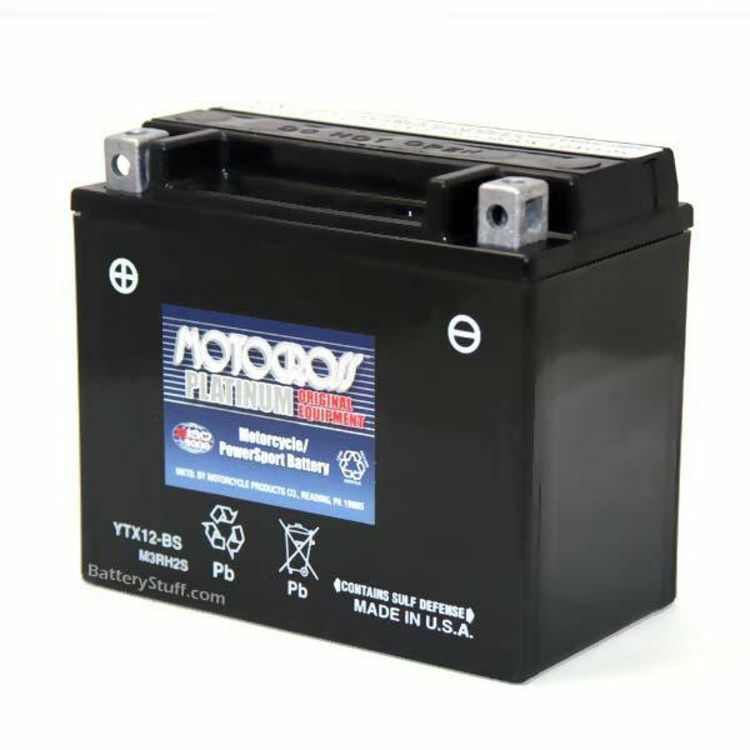 Finally a High Output battery for your High output vehicle. This is the Gold Standard for batteries, built in the USA to withstand harsh conditions that other manufacturers can't match. As the saying goes, you get what you pay for. Rated 4.00/5 Stars from 6 customer reviews. Do you own the YTX12-BS? Please, tell us what you think about it. It helps us provide you with better products. Please note that it may take up to 72 hours for your review to appear. Cons: This battery lasted one year and died. Surprised that it did not last longer. I would never purchase this again. 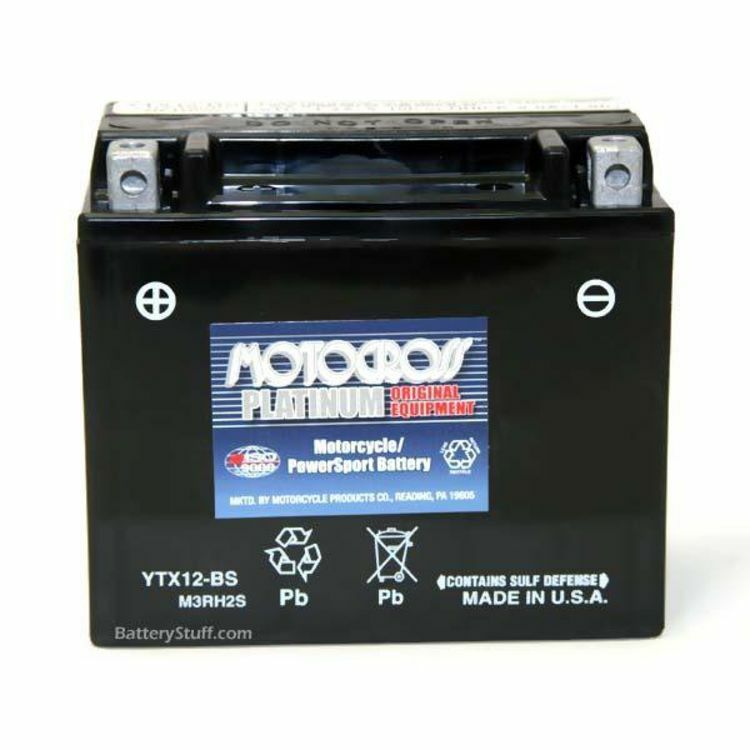 Pros: Exactly correct battery for my scooter. Fit perfectly and started right up. Very quick shipping. Pros: Good while it lasted. Motocross Brand YTX12-BS Made in USA. Pros: This battery is everything a motorcycle should be. 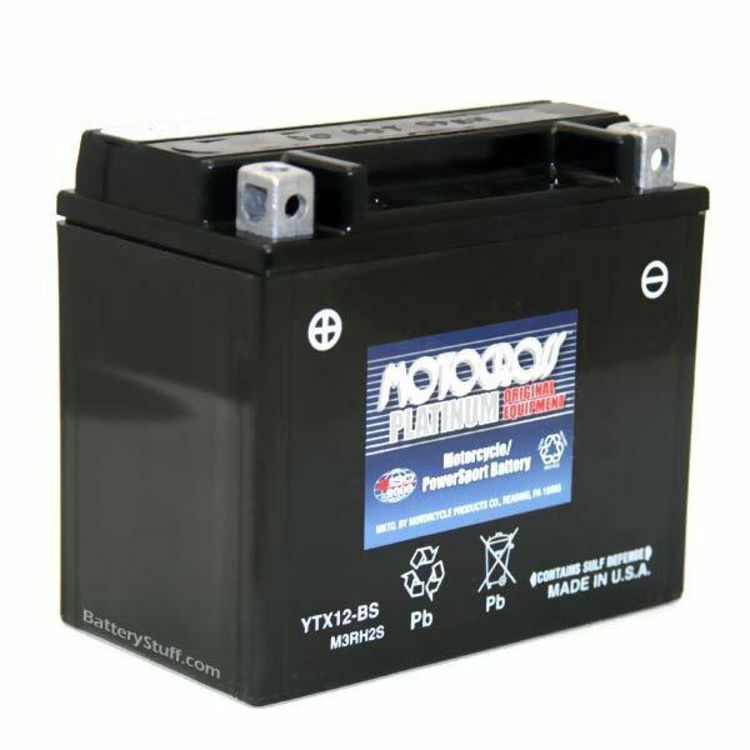 It's a direct OEM replacement that has lasted longer than a motorcycle battery has a right to. I replaced a Motocross battery, in my Honda Valkyrie right before a long trip, only because it was five years old. I kept it as a spare. It was slightly low, but still firing the ignition. I also replaced a Chinese brand, in a Honda Magna, that was in about the same shape after only a year, but had become unreliable. I've traded with Battery Stuff, in the past, and knew I'd get prompt delivery. Pros: I purchased my '05 Bonneville new. It came with a yuasa battery. It finally died for good, but only after I accidently left the key on overnight. I had done the same thing years ago and it survived. What more could one want? Cons: Can think of none. Pros: good prices, fast service, American made, what's not to like? Cons: Never convicted so no cons. Why does my goldwing draw down if I don't drive it for a month and don't put it on trickle charger? My Pacific Coast, 1995, does not do this. Regards. ***Note From BatteryStuff*** Goldwings in general do tend to have a parasite draw due to all the electronics on the bike. If you belive your parasite draw is excessive I would suggest reading our article: Testing Your Battery for Parasitic Load. This may help you track down any excessive parasite draws.